Whether you have a green thumb or not; plants add an element of life, energy, and an organic layer to any living space. If you love plants but are so over setting them on your window sill, read on to learn about five creative ways and places that you can keep plants around your house. Way #1 In the Shower! 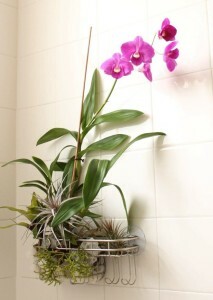 Believe it or not, orchids are considered air plants and grow remarkably well in a moist, humid environment like your bathroom. Why not jazz things up a bit and plant on in a shower caddy? It will give you something to smile about as you step into the shower each morning, wow your guests, and will virtually water itself! Do you collect sea shells but find it difficult to display them? Make them home to a plant, especially during summer months. 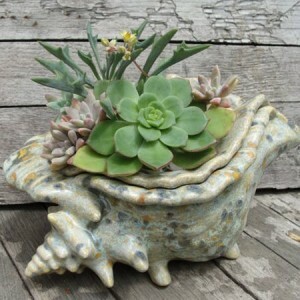 Simply fill each shell with some soil, pebbles, and succulents; which thrive well and are easy to maintain. How adorable (and festive!). 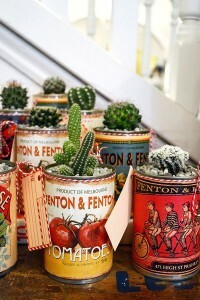 Fill each of these cultural cans with a spiky, miniature cactus. Display them during a Mexican inspired dinner party or simply to add some pops of color and texture to your kitchen. If you begin growing your plants and veggies indoors every year before planting them in your garden, kick things up a notch and make their containers both functional and fun. 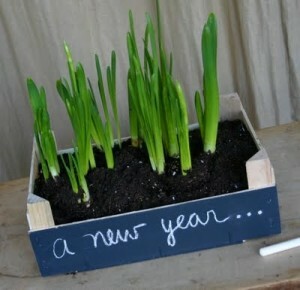 On an old fruit crate, apply a few coats of chalkboard paint. Write a fun little saying on it using chalk once it dries and you will have a cute décor piece when your plants are budding and blossoming. Did you find something super cool at a thrift store or flea market, but aren’t quite sure how to display it or work it into your current design scheme at home? If so, consider putting a plant inside of it! Shop for oversized trophies, milk glass bowls, or even vintage ice buckets. 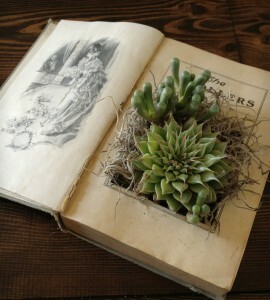 They make great, antiquated plant holders! Let your creative wheels turn when it comes to putting plants in new places (and objects) around your home!